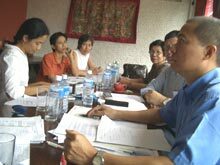 Members of the Working Group for an ASEAN Human Rights Mechanism (WG) met with senior officials of the Association of South East Asian Nations (ASEAN) on the sidelines of the grouping’s ministerial gathering in Vientiane, Laos, on July 25, 2005 for discussions on the creation of a regional human rights mechanism in the region. In what human rights advocates consider a major step forward, the ASEAN heads of state had adopted the “Vientiane Action Programme” (VAP) during their summit meeting last November, which for the first time includes the commitment to establish an ASEAN Commission on the Promotion and Protection of the Rights of Women and Children. ASEAN has now formally asked the Working Group to provide its expertise and services towards the implementation of the VAP, in particular the establishment of a regional human rights commission for women and children. “We welcome the challenge in finding ways of advancing human rights in the region,” said Marzuki Darusman, co-chair of the Working Group. Prior to the meetings with the ASEAN-senior officials, members of the Working Group assembled for a two-day workshop to discuss internal matters and strategies. Dr. Ronald Meinardus, the Friedrich Naumann Foundation’s resident representative in the Philippines, attended the meetings as an observer. “Compared to earlier years, the human rights issue is quite obviously making headway in ASEAN,” Dr. Meinardus noted after returning to Manila from Vientiane.